Think you know ten-pin bowling? 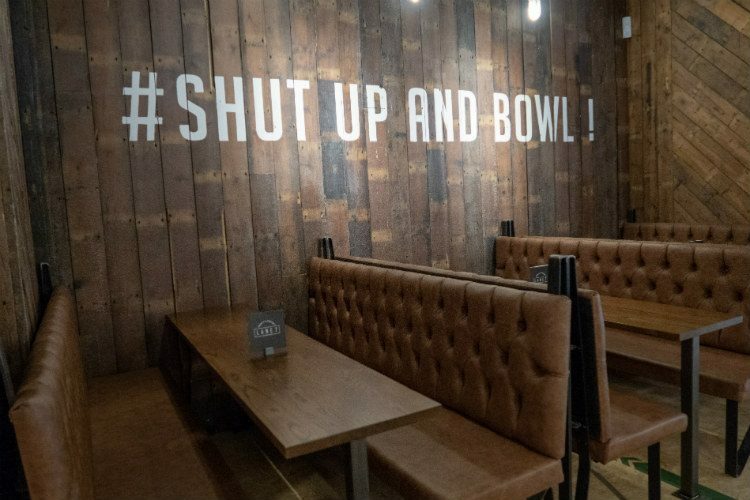 Think again – Lane7 is the boutique bowling alley Birmingham has been waiting for! I was invited to experience boutique bowling at a preview evening, thanks to Lane7. I’ve been bowling countless times over the years, but until this week, I’d ever experienced anything like Lane7 bowling. Forget everything you thought you knew about bowling alleys, because Lane 7 Birmingham is something entirely different. Mark and I headed into Birmingham on a balmy August evening, to visit Lane7 for a preview evening ahead of their grand opening. Lane 7 Birmingham is located in the modern setting of The Cube, close to the Mailbox on Wharfside Street. It overlooks the canal basin, which is such a gorgeous place to be on a summer evening. It would have been lovely to sit outside with a glass of something chilled. But we were there to bowl! We headed into The Cube and down to the Level 7 bowling alley. And as soon as you step inside, you know that this is something very different. There’s none of the bright colours and vinyl seating of the bowling alleys you remember from your teens. Instead the decor is cool and industrial, with lots of dark wood and metalwork. I loved it from the moment I stepped inside! We checked in at reception and straight away noticed the first difference about bowling at Lane7. Instead of punching our names into a dodgy keyboard at the lane, our names were taken and entered into the scoring system at reception. And even better, each person can choose to have the bumpers up or down. No more arguing about whether it’s cheating to have the bumpers up! Lane 7 Birmingham – Bowling, but not as you know it! We were given our lane number and headed through to the lane. This could not be more different from my local bowling alley! The industrial theme continues in this area, and there’s funky ‘street art’ style decoration on the walls. The lanes themselves are walnut, and look amazing. No more hunting for the right bowling ball! And there was no hunting around for the elusive ball that’s the right weight for you. Each lane has a selection of balls from 8kg up to 14kg, which should suit most people. There are 9 bowling lanes and you can rent the space for private use. It’d make a great place for an office party or to celebrate an event – imagine holding a graduation party here? Oh, and did I mention that Lane7 is strictly over-18s only after 7pm? Rather than being a bowling alley with a bar, this is more like a really good bar with a top notch bowling alley attached. The drinks menu covers everything from beer, wine and spirits to cocktails and milkshakes with a kick of alcohol. And there’s a great selection of alcohol-free options as well, including a range of mocktails and Fentimans non-alcoholic drinks. We didn’t try the food when we visited, but the menu includes a range of burgers served in brioche buns. All of the burgers cost £10 including fries, or upgrade to sweet potato fries for an extra 50p. We played two games of bowling, and I lost each of them to Mark. The first one came down to just a few points, but he really ran away with the second game. I just couldn’t compete with that run of four spares in row. So after our second game, we went off to explore the rest of the venue. There’s a fantastic range of retro games, including Mario, Pac Man and Donkey Kong. I can really see my teenage sons loving that area. For something a little different, you could hire one of the shuffleboard or beer pong tables! Or for something completely different, how about this room? Doesn’t this room look amazing? For £20, you can hire the Karaoke room at Lane7, which I reckon would be fantastic fun. I just love the way that they’ve decorated this room. We didn’t try out the karaoke machine (which looks very high-tech! ), but we did enjoy spotting retro game characters and song titles in the black-lit room. Lane7 is just a totally differnt way to go bowling. I’m already looking forward to going back there before 7pm with my teenage sons, and I reckon it will be a great place for a Christmas party! Bowling at Lane 7 Birmingham starts at £7.30 off peak, or £9.95 at peak times. Kids and students bowl for £6.00 per game. Hire of the Karaoke room starts at £5 per person per hour, and you can hire a shuffleboard table for £10 per hour. Beer pong costs £20, which includes the cups, ball and 4 cans of beer. Thank you to Lane7 Birmingham for a really fun evening! Those lanes look pretty smart Sally. I’m in Birmingham next week and staying not far away. I may actually have a look. Do they serve food at all? As far as I know, they don’t serve food. But it’s right in Gas Street Basin, which is packed full of great places to eat and drink. The decor at Lane 7 is so quirky and cool, and I love that it’s over-18 only in the evenings! I love the decor, definitely the coolest bowling alley I’ve been to! It’s great fun, Laura – you’ll love it!